In a nutshell: Kuau cove is perfect for little ones and anyone that loves to explore tidepool sealife. Minuses: Fully-clothed Mama’s patrons might make shy folks uncomfortable in their itsy-bitsy-teeny-weeny-polkadot-bikini. 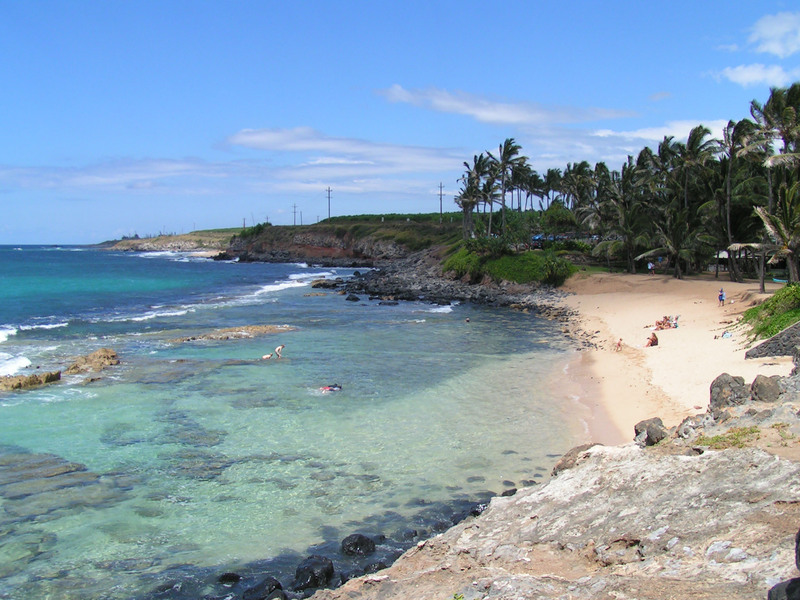 A wonderfully scenic small white sand cove beach just past Paia, bordered by a coconut grove and chock full of tidepools. Kuau Cove, which is commonly also called Mama’s Fish House Beach since most visitors experience this beach as a photo op prior to dining at Mama’s Fish House, which sits just back from this beach. Old-timers may also call it “Father Jules Papa”; Papa is the Hawaiian word for exposed reef, and Father Jules was a prominent figure in the community. The photo above was taken at high tide from a rocky outcrop that forms the wall of the cove. During the rest of the daily tide cycle, much of the reef becomes exposed forming multiple shallow tidepools teeming with temporarily captive sealife. Kuau Cove’s sandy beach is perfect for mom and dad to relax while kids play and explore the tidepools. Bring the kids some snorkel gear, too – it is a safe and fun place for little ones to learn how to snorkel. Parking for Kuau Cove is right a the entry to Mama’s Fish House – although it may appear that the beach is private, the beach does not belong to Mama’s Fish House and is open to all. Blue cones and signs mark spots reserved for beach access. The cones are there to keep Mama’s patrons from using up all the spots, so if you’re there for the beach, you may move them aside to park.